Do you need a door? I woke up too late to meet with my mistress. After work I drove home, greeted my family wearing Cheery Wife/Mom face, and changed out of my work clothes, distracted by thoughts of my patient paramour. Would there be time later … maybe after dinner …? He nodded and loped away. Finally … time to fix chapter twenty-three. I used to require a clean desk, a quiet house, and (ideally) an hour of free time to get any writing done. Now I can write anywhere. I take my chunks of time where I can find them. Forty-five minutes in the morning, in the big red chair, with my coffee? YES. The occasional thirty minutes in an empty office at the day job, during lunchtime? I’ll take it. Waiting room? Hotel room? Plane? I’ve been known to write – to “meet my mistress” – in all of those. But lately I’ve been eyeing the tiny spare bedroom in our house. It used to contain a twin bed, because it’s so small that was the only bed that would fit in there. I think only two houseguests ever slept in it. So we got rid of it. Now my son’s X-Box is in there. This room has a DOOR. I think I want a door. Isn’t it lovely? Read about it (and see more photos) on her blog here. I’m also pretty envious of Nova Ren Suma’s space. In pondering my highly mobile and unfixed writing “space,” I decided to ask other writer friends whether or not they need a door. I've gotten to the point where I can write almost anywhere, and in fact, a good part of SUGAR AND ICE was written in the bleachers at my daughter's skating practices (good for research, too!). My husband and I share an office, but it doesn't have a door. The one thing that's really hard for me is trying to write at home when the kids are home, so we actually just built a room in back of the house for that purpose. It saves me having to leave to go to the coffee shop if I'm under deadline (lattes are cheaper at my house), and because it's separate from the house -- you actually have to go outside and then back in to get there -- the kids treat it the same way they would if I were actually writing away from home. Best case: at my desk, door closed, water and chocolate nearby, music on. But I will write anywhere. The only thing I can't stand is if someone else can read my words as I'm writing. Shrivels me up. I have to have my playlist, and a cocola, and a computer. And I am completely uptight about these. I have configured my laptop so it has exactly the same everything as my desktop, in exactly the same places. All the icons are a specialty set, and identical to my desktop. Word is configured with the toolbars, colors, and fonts exactly the same on both. Down to the system files where I save everything. SAME! My playlists, I make especially for each book. And while I write that book, I don't listen to any other music. NO NEW MUSIC. I even burn my playlist to CD, and listen to it in the car. It keeps me in the right time and place in my head. For myself, the only real need is a computer. Any computer, as long as I can type into a text editor of some kind I'm happy. I sadly can't write fiction longhand anymore, though I do like pen and paper for brainstorming. But given the choice, my favorite writing spot is my desk, with the sun rising outside my window and a blistering hot cup of strong black tea with milk on hand. I sometimes listen to inspiring music, but if I'm on a roll I often forget to turn it on! I like to be in a chair/bed/couch where I can put my feet up and actually create a LAP. It also helps if I'm in a room with soft carpet so my baby can roll around. No music, no TV, no noise. For me, it's like a mental thing to go into my office. Sometimes I do have to turn the Internet router off, but mostly it's having a designated work space that says "work" to me. I just write best at my desk. I just need my computer. And usually some coffee. Everything else is optional. I am not as good as I should be about having a routine. And sometimes it helps to shake it up a little. I rent an office, but I don't necessarily actually write there. 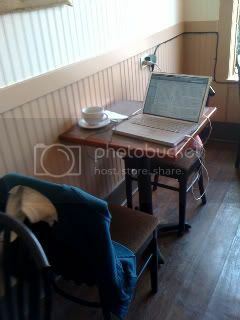 I write at home, office, coffee shops, library ... wherever I'm in the mood for. Office is more about "a room of one's own" than writing-only space. Sometimes I go there and just read, or just do businessy stuff. I like having a place that's not at home, just mine. I know Laini Taylor has been writing in a café near her house for several months now. I've just been thinking about this... I tend to change places a lot. Sometimes at a desk, sometimes a dinning room table, sometimes the couch, occasionally on the floor, coffee shops, libraries. I feel like a shift in location frees me up and reduces the expectations I might have about "making something great" and allows me to just get on with making something. That tiny little bedroom with its cleverly-closing door … it may be the secret to putting me in a haze of flow-sustaining productivity!!!! I do have a writing space at home. Isn’t it cute? 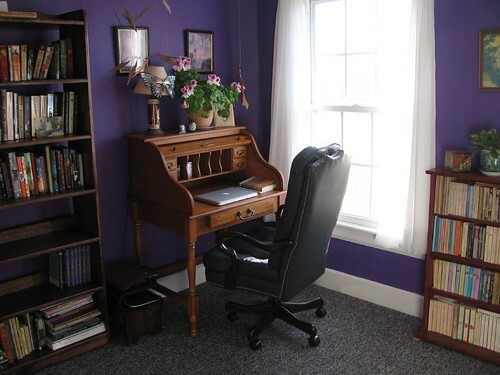 (A purple wall, like Deva's, which is supposed to enhance creativity.) This photo is from a few years ago – wow, look at that big old heavy laptop! – but the space hasn’t changed much. Probably because my desk is always cluttered and there’s NO DOOR. The space used to a room, but became access to stairs when we added on to the house. Feng shui-wise, it’s a disaster. I’m going to keep pondering for now. Part of me actually likes hanging out in my squashy red chair in the living room – easily accessible to my husband or son, should they have a sudden desire to speak to me/kiss me/ask me for allowance. What about you? Do YOU need a door? I have to drive 5 miles and get behind my locked door with my coffee! Oh yes, I remember your studio! And I see you had a fun, messy, productive day! I am so thankful for my door...and desk..and easel....and QUIET!! I looooove this post. I love seeing everyone's workspace. Mine is, sadly, on the edge of my dining room table. Since I work while I'm taking care of the kids, I have to be able to run in, sit down for a minute or two, then run off. I have to be in the middle of the chaos. It isn't ideal. If I do get the opportunity to work with a closed door, I get a lot more done, but that's rare!! I need a door. I think I need one, or should have one. Maybe. My husband bought us a house with a spare room for an office, so I'd have a door. But somehow I let my daughter convince me to let her put her desk and computer in here also. But I have a door! Can I close it? No...the dogs go wild if they're shut out...or in. But I have one. A door. Neat post :) My computer is set up in my husband's office (with a door) -- I can write there when he's not here. When he's there with me, I tend to focus on other things (like my paying online job). We're getting a laptop, and that will help me (as I can take it to places where others aren't)...I mostly just need my family to let me write (which they're not so good about, despite the door). I love this post! Deva's purple walls are my favorite. 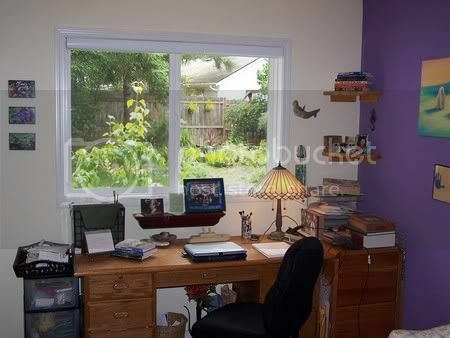 I'm totally fascinated by other authors' writing spaces. It sounds like Saundra's got the right process for that, according to the article Jon mentioned. Wow - I love those purple walls! I do not need a door. When writing at home, I'm usually sitting on top of my bed with my laptop, although sometimes I relocate to the dining room table. But I have weekly meet-ups with Angela De Groot ( angeladegroot) at her house (dining room table), Borders cafe, the library and Panera (and yes, we typically meet four times a week). I like the idea of having my own office space, but right now, our house just can't hold it - three bedrooms, all occupied, no extra rooms with doors to be found. Yeah ... I like the *idea* ... but I'm not motivated enough to make that tiny room my own. A writing space and desk is one of my major goals for my next apartment. I feel like I would still continue to write other places as well, but it's tough to stay organized. I'd like somewhere to keep notes printed out and have books around...yanno, besides my bedroom. Hi Lisa! Great post -- I love that image of you writing in the passenger seat! I so get it. I wrote my first novel at the kitchen table, and by the second novel had converted the guest room to my writing room. Shockingly, this did not make second novel easier to write! GASP! And now, yes, fourth book is being completed in a coffee shop. I also used to need silence. Necessity has taught me to get over that one! It IS really nice to HAVE the dedicated space though, and have a special bookcase for your research books, and a place to put your, ahem, MORRIS AWARD :-) You should totally convert the little room, even if you don't use it that often!!! Wow, your purple really is a match for mine! I love it! So fun to see other folks' writing spaces! I hope that if I ever reach a point where I have to write in smaller, noisier increments that I can do it -- all you guys who manage to do it are an inspiration! Thank you for mentioning my writing space! As you can maybe guess from that photo, there are many desks in one room, so there is no door to close to keep others out. Living in Manhattan, I've had to get used to writing with people around me. You have to adapt to what you have, I guess. Otherwise, I'd never get to write! I also write some mornings in a café, with people everywhere, so I don't need a door, but I do need a *place* to go that's simply for writing. But I do fantasize often about having a big enough apartment where I could have my own writing room... with a door. One day. Loved reading everyone else's responses to your question. I couldn't talk about writing spaces without including yours! What fun to see other people's spaces! I have a door, but I hardly use it. That room--my office--is where I wrote book #1. Book #2 was written on an ancient laptop (we're talking so old it only took floppy disks) on the living room couch. Book #3 is being written mostly on the (new) laptop in the rocking chair in our bedroom, next to the big windows overlooking the street. One advantage to this is that the cats can't sit on my lap while I write. Which sounds lovely, but then they use my arms for pillows and my wrists get tired. Surprising how heavy little cat heads can get.